Tablets, tablets, tablets. Tablets are everywhere these days. Sure, I’ve read the sales figures. Last year the tablet market peaked at around $20 million USD, and this year it’s expected to exceed $55 million USD. By 2014 the tablet industry will break the big $200 million USD mark and pretty much become a permanent staple of our culture. What does this mean? Just this week in various coffee shops around town I’ve noticed that the number of people hanging out with tablets almost exceeds the number of people with laptops and netbooks (myself included!). I can only imagine what it will be like at the universities this fall. Laptops were once that trendy new piece of hardware that all the fashionable students dug out of their bags to replace the old time pen and paper combo. Not long after, that honour was passed to netbooks. Will tablets start taking over classrooms? It seems likely, as in some recent news, over in Korea the governing body is planning on phasing out paper in schools by 2015 and having students use inexpensive tablets instead to handle all their course work and material. What’s more, with all these companies, such as SONY, HP, and SAMSUNG, jumping in on the tablet development bandwagon we’re starting to see some interesting new designs that seem to be fuelling some competitive development and innovation. 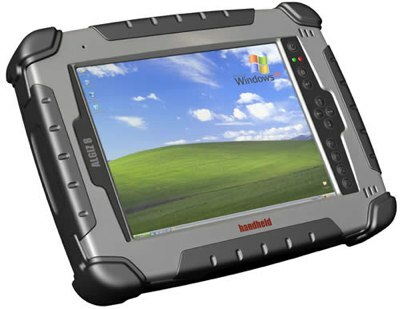 For one thing, there are even these new kings of “rugged” tablets out there, manufactured for contractors and warehouse workers, which can take one heck of a beating. What’s the world coming to if we can safely bring a pocket computer with us while driving a forklift? The reality of it all is that just as cellphones managed to invade into our personal lives over the past 6 years or so and become every bit a part of us as our own skin, so will tablets. Smartphones kick started the move in that direction back with Apple’s iPhone, the predecessor to the modern tablet. Those phones spawned the innovation which led to the iPad, which when first released had some rather lack luster support (! ), and finally into these very tiny and very durable “tablet” devices that sooner or later everyone will start carrying. With the internet at our fingertips, our own personal GPS, and friends stalking us on Facebook 24/7 asking us all kinds of useless questions, it makes me wonder if the days of going for a road trip and getting lost are far behind us. Heck, in 10 years will we even remember what a pen does?